What does it take? Part II. In my last entry, I talked about the difference between simply getting into space and getting there for any length of time, i.e., reaching orbit. Today, we’re going to visit why getting into orbit is such a big stinking deal. This is what it took to get three guys to the moon. Recall from last time, we discovered just to get into space and stay there, you’ve got to reach a speed of roughly 17,500 miles per hour. That’s a huge amount of energy to spend to get there, even for just a tiny little bit of mass. Take a look at this picture to the right. Do you see those little black specks just to the left of the left set of treads on the transporter? Those are people, and just to the left of them is a car. Now take a look at the very top of the rocket. The part of the rocket that actually carried people to the moon and brought them back wasn’t a whole lot bigger than that car. The rest of that thing? That’s what it took to heave that up there. 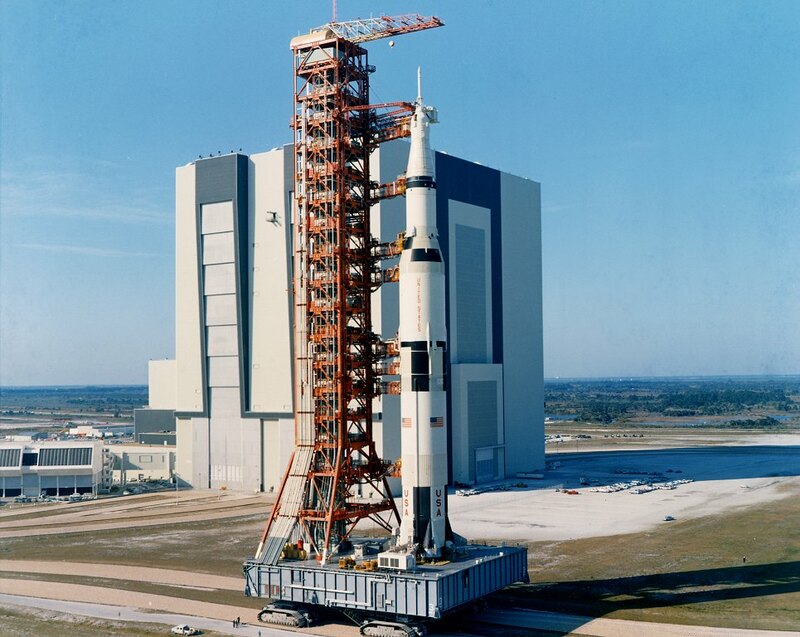 It took a skyscraper-sized rocket to get a car-sized capsule to the moon and back. Now why is that thing so big? In a word, fuel. Size-wise, not very much of that rocket is responsible for actually doing the work to get them to the moon. The bulk of that vehicle is basically a set of giant fuel tanks. The problem is, of course, that for every bit of fuel you intend to burn at altitude, you need to burn more fuel to lift that fuel up. If you do the calculus, you’ll arrive at one of rocket science’s holiest of holy equations, the Tsiolkovsky Rocket Equation. This equation applies for any rocket maneuver. Getting into orbit, getting out of orbit, going from low-Earth orbit to the moon — doesn’t matter. So what does this equation mean? Well, let’s start from the left and work our way right. is the change in velocity. Any rocket maneuver is going to be based on such a change. Getting into orbit is a 17,000 mph change, for example. Getting from low-Earth orbit to escape velocity (if you wanted to, say, visit Jupiter or Mars) is going to be another 8,000 mph. These aren’t small changes we’re talking about. is the effective exhaust velocity. It’s related — though not exactly equal to — the speed at which the rocket engines can expel the combustion products. In a way, it’s a measure of the fuel-efficiency of a rocket engine. For the space shuttle, this value varies (sticking with miles-per hour) from just under 8,000 mph at sea level to just over 9,900 mph. Finally, and are the initial and final masses of the vehicle. The difference between the two is the propellant (i.e., fuel and oxidizer) that will get expelled at high speed from the engines. The logarithm there means that as required velocity change increases, the fuel required increases exponentially. So, as an example, suppose it takes 20,000 lb of fuel to deliver 5,000 mph of to a 10,000 lb rocket. Suppose that we want to double the we provide. By this equation, if we use the same engine, we would have to square the mass-ratio from the original requirement. So, if 5,000 mph requires a 3:1 mass ratio, 10,000 mph is going to require a 9:1 mass ratio. This means that to double our velocity change, we need to go from 20,000 lb of fuel to 80,000 lb. Getting to 15,000 mph would require a 27:1 mass ratio — 260,000 lb of fuel. Adding capability quickly becomes … *ahem* … astronomically expensive. Now…. the worst part. That’s not even the whole story. This doesn’t say ANYTHING about thrust, i.e., how much force you exert. If you are going to lift a heavy rocket off the ground, you need a lot of force. Unfortunately, engines that have a high thrust tend to have low — the shuttle’s solid rocket boosters provide 83% of the liftoff thrust, but they have of just slightly higher than half that of the main engines. This enormous tradeoff between thrust and efficiency makes the first stage of rocket flight incredibly expensive — the shuttle burns through half its fuel in just the first two minutes of its eight-minute ascent. With all this expense, it’s no wonder that we are only just now seeing private ventures build spacecraft that can reach orbit. We haven’t even scratched the surface of being able to do something useful once we’re up there. Next time we’ll talk a bit about orbital mechanics and how we control exactly where in space we go. This entry was posted in Uncategorized by swglasspit. Bookmark the permalink.